There are almost as many reasons for doing this as there are couples. If you’ve come through a challenging time and emerged on the other side with a fresh sense of possibilities, you may want to seal your renewed sense of commitment with a ceremony--to affirm what you mean to each other, and say it in the company of those who mean something to you! Maybe you want to tell the person you've loved all this time just how much better life is because of him or her. A wedding anniversary milestone may prompt you to look back and reflect on the journey you and your spouse have traveled together. A vow renewal ceremony can be a great gift and inspiration to your children and loved ones, and invariably, it is romantic! I will write a ceremony for you and with you that will completely reflect who you are. It can be formal, casual, poetic or fun. The following two examples are just that, samples. After reading it, let your imagination fly! What a happy occasion this is! Marriage is a promise made in the hearts of two people who love each other which takes a lifetime to fulfill. Terry & Chris, when you first joined hands and hearts __ years ago, you did not know where life would take you. You promised to love, honor and cherish one another through all things. Life has surely brought you both wonderful blessings and, probably, real challenges, too. [Optional: refer to some of these] And your love has brought you through them all; through your years together you have grown, and now you stand here today to reaffirm your pledge to each other. The Universe is smiling! Today, Terry and Chris, you are choosing to reconfirm your commitment to each other, and to seeing your marriage continue to grow and blossom in the years to come. On your wedding day you exchanged rings as a symbol of the never-ending circle of love. Rings serve as a reminder of your wedding vows to each other, and your commitment to live in unity, love and happiness. At this time, it is appropriate to reconfirm the meaning of the rings you wear. Chris, I wear this ring you placed on my hand------------- as a symbol of my love and commitment to you. Terry, I wear this ring you placed on my hand--------as a symbol of my love and commitment to you. I ask that you each remember to continue to cherish each other as special and unique individuals and that you each respect the thoughts and ideas of one another. And most of all, be able to forgive each other, and not hold grudges against one another. Live each day in love with each other, always being there to give love, comfort, and refuge to each other, in good times and bad. Terry and Chris, today you have renewed the promises and vows you made to each other on your wedding day. You have symbolized the renewal of the marriage union by the joining of hands, the taking of vows, and by the wearing of your wedding rings. It is my absolute joy to recognize and acknowledge the love and commitment which have brought you here today to renew your marriage vows. May you now go forth together in love. Go forth with hope and joy. May the spirit of love in the Universe continue to bless your lives together, so that you may be a living example in your world of what true Love can be. What a happy occasion this is! Welcome, family and friends of [wife] and [husband]. You are the special loved ones whom they wanted to have here. Your love and support are so important to them. 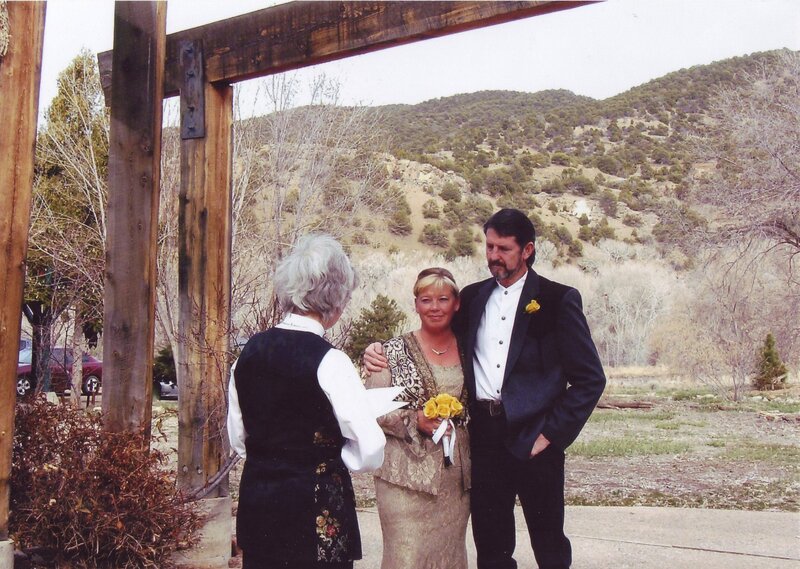 [Wife] and [husband], when you first joined hands and hearts 20 years ago, you did not know where life would take you. You promised to love, honor and cherish one another through all things. Life has surely brought you both wonderful blessings—including [the birth or adoption of children, mentioned by name; other noteworthy blessings]-- and difficult tribulations, too [perhaps mention also]. And your love has brought you through them all; through your years together you have grown, and now you stand here today to reaffirm your pledge to each other. The Universe is smiling! Praise be that I am yours …That you are mine! I am here to renew my promise that you shall never walk alone. I promise I shall do my best. I feel so blessed to call you mine. It is my absolute joy to recognize, with you all, the love and commitment which have brought [wife] and [husband] here today to renew their marriage vows. Thank you for being present today. Continue to cherish and support them.